Whether you own a cosy single bed or an expansive King-sized one, the common factor between all types of beds is the headboard. But while not many people may give it a second thought, dressing up a headboard is actually a great way to subtly introduce visual interest in your bedroom without overwhelming the space – here are some simple ideas that you can do-it-yourself. 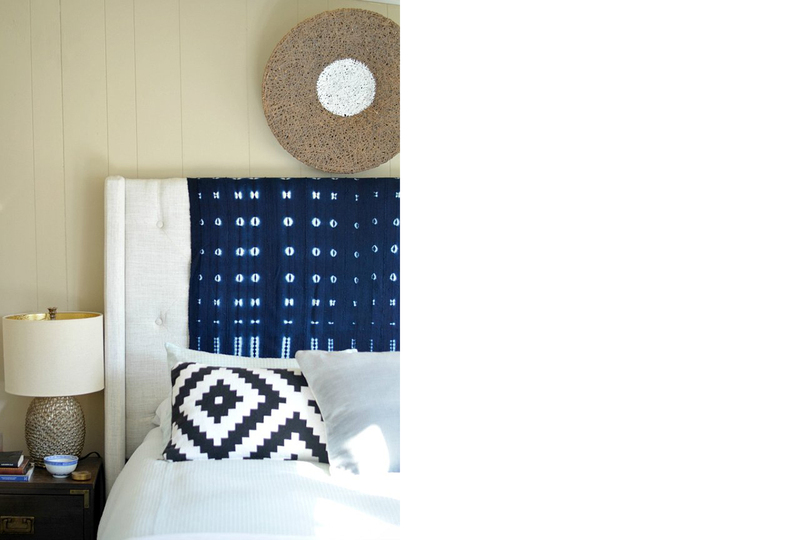 This idea is as simple as it sounds, all you have to to is to drape your favourite piece of fabric or rug over your headboard and attach it with ribbons or clip-on drapery rings. Be it a beautiful rug you picked up from your travels, or a piece of patterned fabric lying around your home that matches your room’s colour scheme and personal taste, this sleek yet uncomplicated idea will allow you to deliver an instant pop of colour to the space. But what makes this idea even better is that you can swap out the fabric in accordance with the seasons, or simply when the mood strikes you. Although headboards are expansive in size and are usually viewed at as a whole from a distance, you shouldn’t think that the tiny details are inconsequential. If you have a fabric headboard, applying a nailhead trim around the border is a simple and inexpensive way to dress it up. If you’re feeling a bit more ambitious, you can even sketch out a fancy pattern and add the nailheads in the centre. While intricately designed headboards may work well for lush or eclectic bedroom settings, it might turn out to be visually disruptive in an uncluttered space. As such, instead of a solid fabrication, create an airy design by cutting out a geometric lattice pattern into the headboard. Not only does the minimal visual weight maintain the calmness in the space, having such an understated headboard will also allow you to draw attention to the colourful furnishings – such as a throw pillow, blanket or even artworks – you might have around your bedroom. 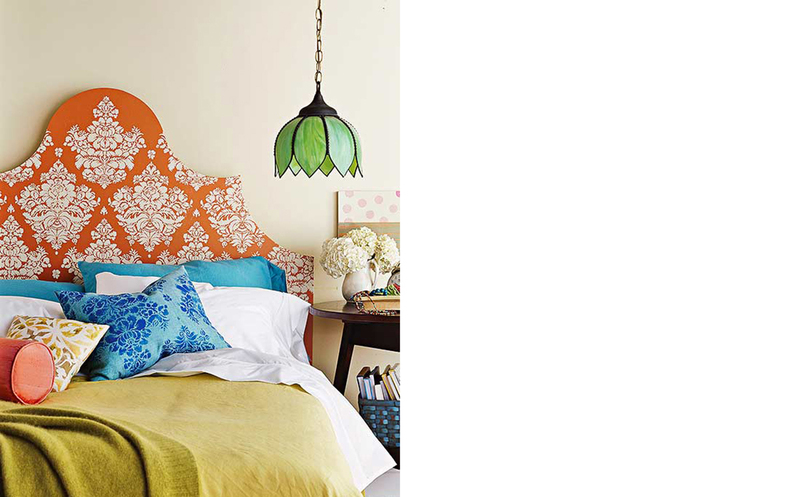 While they may sound tricky, dressing up your headboard with intricate details is not difficult at all. There are plenty of online crafts websites that offer great stencil templates, and after you’ve narrowed it down, all it takes is some fabric paint and a little bit of patience. Simply secure the template into place with tape and then brush it over with thin coats of paint until you achieve a consistent look and feel between each stencil. If you want to update your headboard but don’t want to stick to something permanent, wall decals are a great alternative that offers style without commitment. Best applied to wooden headboards, simply apply the decal to a smooth surface and burnish to remove any bubbles or ripples that may have formed. Do note though that while decals are removable, you should try as much to have your placement perfect before you attach them, as some may be difficult to reapply after they’ve been removed. An ever-popular design concept, giving your headboard the Industrial treatment is a great way to update it with a style that will last you through the years. A combination of wooden planks with a steel frame yields a headboard that not only has an industrial edge but gives off an undeniable warmth as well. And if you want to take the visual interest up a notch, you can even double the height of the headboard and pass it off as an accent wall in the room.